Want to explore Crete and its wonderful countryside at a faster pace than just hiking or walking? Then the best way is hiring a mountain bike from one of the many bike hire shops in every resort in Crete. 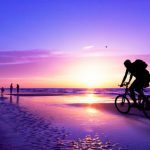 If you don’t have the facilities to take your bike on holiday to Crete then there are a select few professional bike hire firms that provide quality bikes for you to hire for your biking holiday. More information on bike hire and excursions is covered below to make sure you have a fantastic holiday biking in Crete. As with all other guides when exploring places you don’t know, make sure you cycle in a pair or group and have enough supplies for the journey. Crete in the height of summer can be extremely hot and arid and being stuck somewhere you don’t know can be dangerous. Leaving at first light from Ierapetra by bicycle, go west towards Gra Ligia without having to change gears along this flat route until the point where you must turn right onto the local road which ascends towards a convent. Turning left you arrive at the traditional village of Anatoli which is very beautiful. The view from this village is amazing, from here you can see the Bramiana dam and the Libyan Sea, with the island of Chrissi. After a short distance the pine forest of Selekano will stretch out in front of you. Before reach Malles, the road that branches to the left leads to the Monastery of Exakousti which is well worth a visit and a photograph or two. From here you make your ascent, and by following a circular route back to Malles you will pass an old settlement of Agios Georgios. Before reaching the village the village of Mithi, by following the riverbed you can see a gravel road to your right where you can observe the dam of Sarakina. After Mithi you finish your trip at the village of Myrtos where you can enjoy a refreshing dip in the clear blue sea. From Myrtos the road that runs parallel to the beach leads you back to Ierapetra. 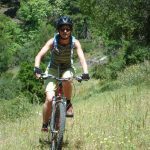 One of the highest rated and recommended cycle tour companies within Crete is Olympic Bikes who are based in Rethymnon but can cater for tours all around Crete and they really know their stuff when it comes to biking in Crete. You get professional service from the multi-lingual guides which are highly trained and have a passion for cycling. Olympic bikes is the only EOT certified and licensed biking organization with Crete.